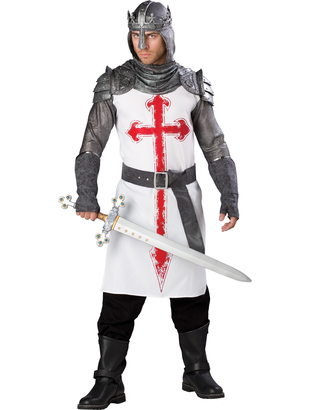 The Elite Crusader Knight Costume includes a white tunic with attached chain mail sleeves and a red cross printed on the front. A chain mail hooded cowl, vinyl headpiece and vinyl shoulder guards are also included. To complete the look a pair of gloves and a matching belt are also included. 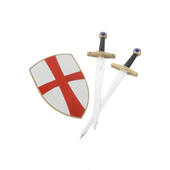 Why not add a sword to finish off the look? Please note Trousers are not included in the costume.